Critical thinking is an important tool in approaching dreamwork. 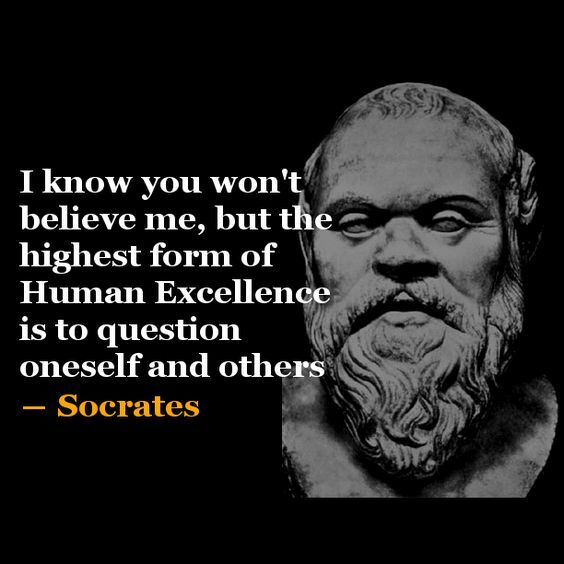 Critical thinking is not criticizing something, but rather stepping back from immediate assumptions, interpretations, conclusions and letting a situation be so that a variety of interesting things may happen, so that whole new ways of viewing and subsequent reflective thinking that involves asking questions may emerge. This helps us avoid some common misleading approaches to working with dreams such as literally interpreting a dream or avoiding looking at a dream because it may be frightening or emotionally overwhelming. That is not to say dreams can’t be literally true. Sometimes, they are but in most cases dreams have many rich levels of meaning that are often in spiritual in content, making it hazardous to interpret literally—much like reading the Bible. The act of stepping back prevents us from forcing a premature meaning on the dream. It makes space for the dream to speak to us, often by drawing in, feeling and savoring any emotions that are associated with the dream. We are then able to think about and leisurely reflect on the dream in a broader manner which includes more of the dream such as feelings, images and later reflection on this content. Dreams have a lot to do with spirituality. From ancient times, dreams were seen as the visual expression of the soul and the means through which divine beings communicated with humans. Even today, Jungian psychologists note the great importance and help that dreams can provide in revealing the concerns of the soul. 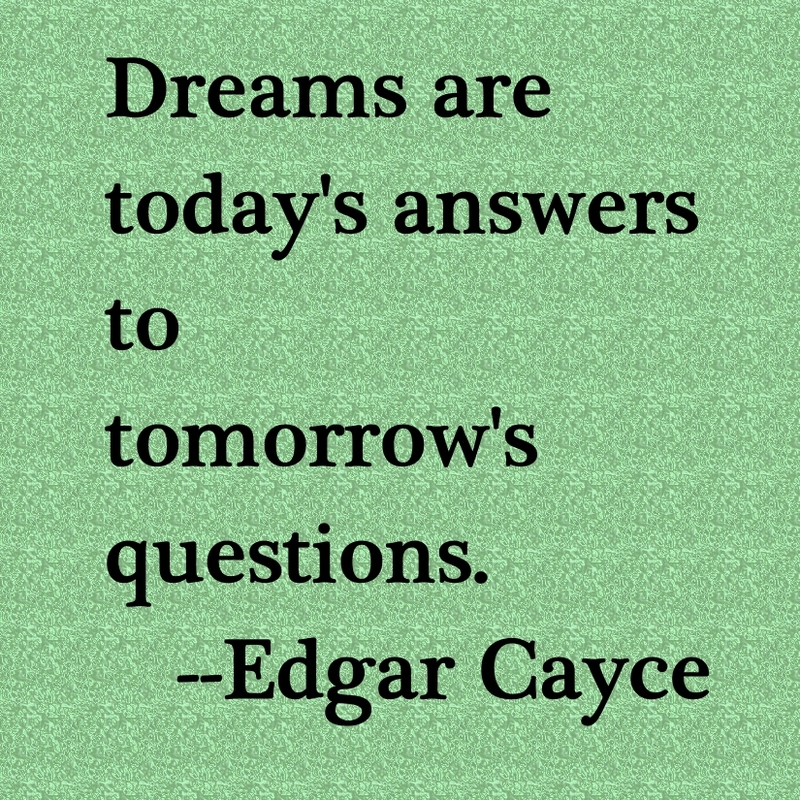 Edgar Cayce, a great intuitive seer of the 2oth century and so-called Father of Holistic Medicine, considered dreams to be a true source of information above and beyond what our waking mind could comprehend. He considered dreams to have different levels of meaning but all dreams had a spiritual meaning. Therefore, it is important to see dreams as a spiritual expression of one’s deepest self. You are giving your soul a voice—an often ignored cry in those who ignore their dreams. Since dreams convey the concerns of the soul, listening to and taking dreams seriously is the equivalent of taking the soul seriously! Give that Inner Voice a platform for expression! Getting to know your soul’s voice and its special language and symbols as expressed in dreams is really an act of getting to know yourself better. By listening to the Inner Voice through dreams, the dreamer gets more deeply in touch with themselves. True spirituality is all about deepening relationships, especially the one with yourself! Dreams are also vehicles for one’s higher power to speak. They are a great way to receive contact from a spiritual guide. The Bible is full of stories of how God spoke to humans. It can happen to you, too! Ask for a dream from your spiritual guide to help in a time of crisis. What a way to boost your spiritual development when you receive wisdom beyond the waking mind’s ability to comprehend. One of the special gifts that come with dreams is an experience of the sacred. We may have a dream of a holy person, a deity, a ray of golden light, or a physician that is healing us. These sacred dreams often have a numinous quality about them; that is, through the images and feelings in the dream we somehow know this dream is coming from a divine source. Once a person has a dream like this, they need no convincing that there is a greater power beyond them. These dreams are humbling, yet they can evoke profound gratitude and sense of joy in the dreamer. Sacred dreams can come at any time but they often tend to come when the dreamer needs them, such as at the start of a major life change, or in the midst of a difficult transition. In these cases, there seems to be the purposes of inspiring and encouraging the dreamer make it through a difficult challenge, or to take on the challenge. 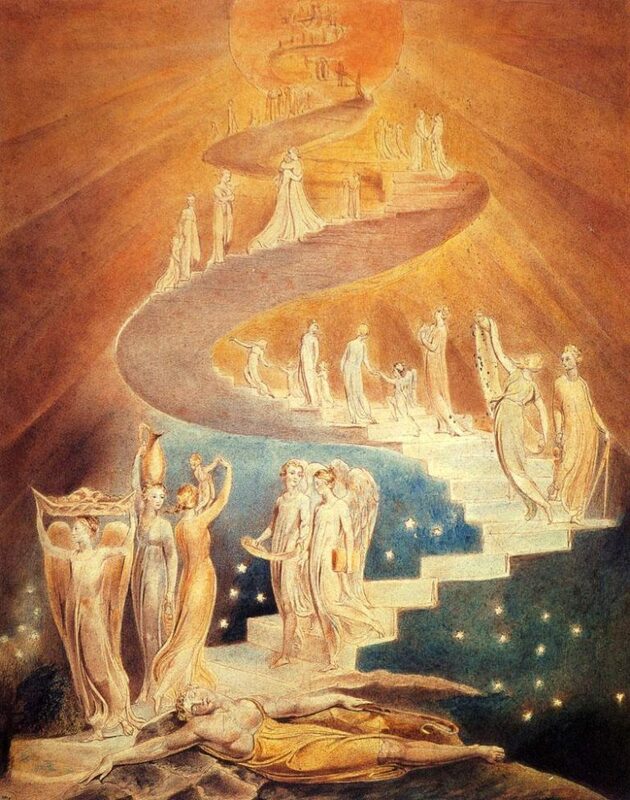 When thinking of sacred dreams, the Bible story of Jacob’s ladder (Genesis 28: 1-19) comes to mind. Jacob is in serious conflict with his brother whom he just cheated out of his birthright. He has run off to the desert, no doubt wondering what will happen to him. Instead of disaster, in a dream he sees a ladder on which angels descend from and ascend to heaven. The Lord appears to him and tells him that he will have many descendants and be given the land on which he rests. The ladder is the connection between heaven and earth, just as the dream connects the dreamer to divine inspiration. Our dreams can be a ladder connecting us to our spiritual guides and higher truth. Have you seen a ladder in your dreams? Where was it leading to? It is definitely leading you to somewhere beyond where you are now. Are you willing to go there? Jacob was so in awe of his ladder dream he named the place where he had the dream Bethel, the House of God. If we see our dreams as the place where divinity can come to visit us, we would take them much more seriously. Dream: I am in a clinic and see my usual buoyant, optimistic, smiling self in a mirror. Then I let myself feel my real feelings. I am feeling unusually grim and pessimistic.A doctor comes up to me and uses a stethoscope to examine my heart. I ask why he’s doing this. He tells me I am not in my usual emotional state and he just wants to check me out. I know he is right and intuitively feel in the dream he is mainly concerned about my emotional heart, not necessarily the physical one. Then another doctor does the same, focusing more on the left side. When I woke up I was touched that some dream physicians were taking care of me and my emotional situation. It made me focus more on what I was feeling at the moment and not on the breezy, upbeat persona I was reflecting to the world. I needed to look at the left side (the intuitive side) of my emotional heart. Since I just finished teaching a class this past semester, I have time to rest and spend a little more time with myself and getting in touch with those feelings that are dragging me down. Maybe the dream doctors were tell me I needed to manifest their thoughtfulness and concern for myself. 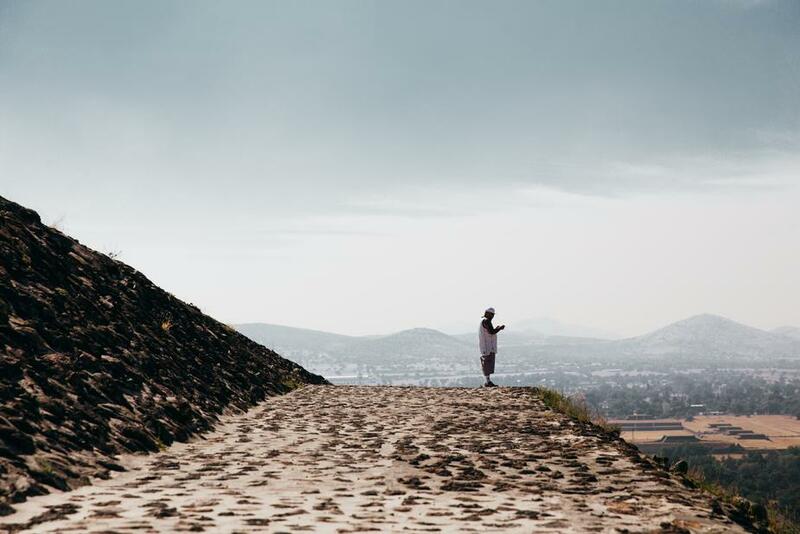 Praying from a place of genuine need draws a response from God. It is said that the universe bends to where a genuine need exists and where a heartfelt request is made. I certainly do believe that prayer coming from real need is heard, and when prayers are not answered, one reason could be that God or the universe (whatever makes you feel more comfortable) just doesn’t perceive it as a real need, only an ego need on the part of the person praying. The question arises then as to what constitutes genuine need, and how is it different from needing something just to soothe a bruised ego? It seems to me that genuine need arises out of significant suffering, the kind of suffering many people tend to actually deny, endure or cover up for a variety of reasons. This could be something horrendous like suffering sexual abuse or it could be something relatively less horrific like putting up with a chronic health condition. Dreams are very good at indicating where the genuine points of pain are located at the deep psychic level. These points of pain may be symbolized in the form of injured animals, a sick, dying or dead person, or some jarring situation such as a car accident. When these uncomfortable scenes are seen in dreams we tend to think of them as representing something outside of ourselves. In some cases, that may be true. However, usually, they represent an aspect of ourselves that is wounded, sick, dying, dead or being put in jeopardy. When I have dreams like these, I immediately make it a point to pray for this aspect of myself that is suffering in such a way—even though I may not recognize it immediately since it may stand for something I may not yet be cognizant of in my waking life. I feel this is praying from the deepest and most genuine part of myself, surely opening a pathway to God and the universe for healing. In a series of blogs on kundalini energy as it appears in dreams, I have written about snakes and volcanoes as being important symbols. Fire and flames are also dramatic and powerful symbols for kundalini energy, and when they occur in dreams, it is hard to forget. The dream is very wise to choose this symbol to convey the workings of kundalini energy because fire is similar to kundalini in that it burns away all that is harmful or not necessary and brings light to guide those touched by its energy. Dreams about things burning can have many meanings on the physical and spiritual level, but first and foremost one should look for a spiritual meaning because all dreams have a spiritual message at some level, and fire dreams are particularly connected to the work of the spirit. The imagery of something burning calls to mind the biblical story of Moses and the Burning Bush (Exodus 3:1-17). A burning object always attracts our attention and focuses our mind on a dramatic transformation that is taking place before us: the transmutation of something physical into something else such as gas and ash, or in the case of the Burning Bush, the presence of a divine being because the expected transmutation wasn’t taking place. Spirituality is about transformation and being in the presence of the divine. As in dreams about snakes and volcanoes, one has to ask what is going one in one’s life so that fire and flame appear. A fire dream may be merely an expression of one’s fears about a house catching fire because of fire hazards in the house. However, if one is experiencing strong kundalini energy in one’s body, it may be giving the dreamer a chance to observe what this energy is doing and how it can be managed. I am with a friend and some other people. They have just come out of a store. I invite them into my car since I can seat 6 people. When I start the car, a little alert icon on the dashboard goes on and I yell for everyone to get out. The car is on fire! Everyone jumps out and is OK. I want to use my cellphone to call 911 but my friend says not to. This dream came about a year and a half before I experienced the onset of kundalini energy in my body. A car can be a symbol for the body or for how we get around in life. In any case, it was alerting me to the possibility that my life would be affected by a strong energy like fire. It would cause me fear and concern but the dream is also telling me that I (and the many parts of myself represented by the others) would be OK. My friend (who is a wise and knowledgeable person in waking life) tells me it is not important to call 911. This is odd so it makes me think this dream is not predicting something physical but maybe a spiritual process that is meant to happen. 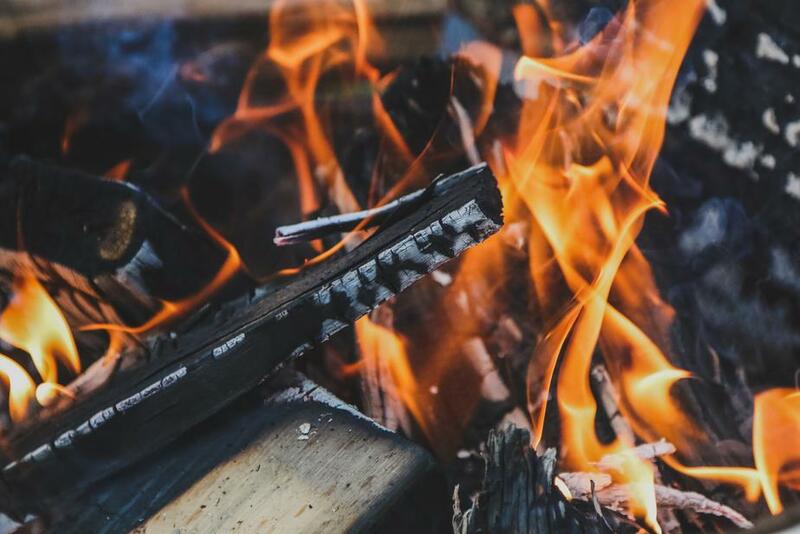 The burning car is a symbol of a transformative process that is OK. The Dream: All About You! The German psychiatrist Fritz Perls is credited with developing the dreamwork practice of considering that everything in the dream is a part of oneself. To be more specific, I tend to think every symbol, process and event in the dream is indicative of energies within the person and what is transpiring with those energies. Either way, using this method to work with dreams can be challenging in that it asks the dreamer to “own” certain symbols, processes or events he or she would, in many cases, rather deny. For example, if I dream I am in a room where an angry man is beating a weaker man, I may not want to admit that a part of me is capable of beating up another person, especially if I am a person who is uncomfortable showing any kind of anger. Yet, this is what this dream method is asking us to do. It can be heady stuff but the method will allow the dreamer to discover hidden aspects of him or herself and bring that to light, and perhaps even heal. Using this method I may discover that I am capable of being angry enough to beat another person or I may find that a part of me is beating up on me! This humbling realization is often what spiritual growth is all about. We find that we are not perfect, and in that discovery develop compassion for not only other beings but ourselves also. It’s as if each piece is part of whole and our job is too see how each piece fits into the whole, like doing a puzzle. 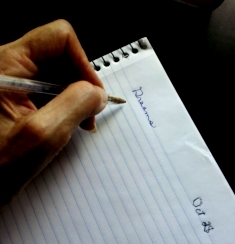 Next time you have a dream, write it down and consider that each symbol, process and event is part of you. What energies are evoked? What makes you feel uncomfortable? What is the “saving grace” or helpful element in the dream? The darkness and light within you will be there to discover, and the intelligent interacting of the two will be there for you to appreciate and give you wisdom. 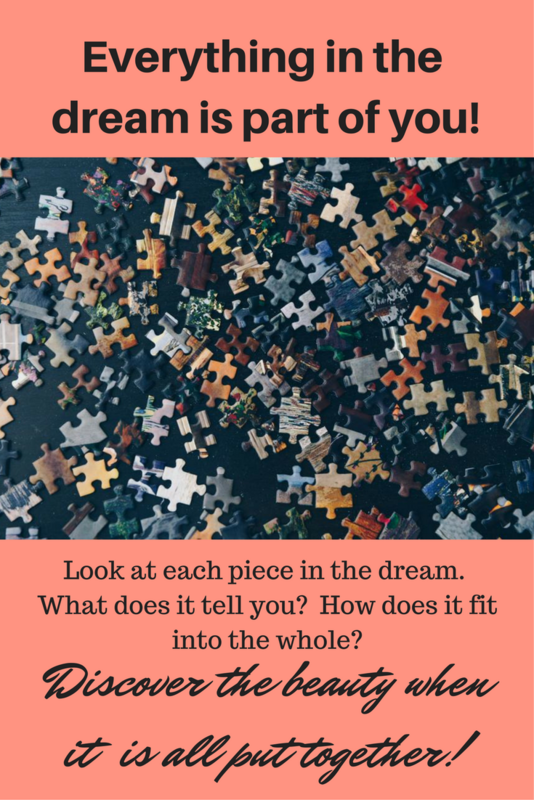 It is a challenge that is well worth taking up in dreamwork as you take up the pieces and fit them together. John Welwood in his well-informed book Toward a Psychology of Awakening, notes that full human potential is realized when there is a combination of self-integration and self-transcendence. Psychology has concerned itself with the former and spirituality with the latter. They are considered to be two entirely different areas of growth that are traditionally developed with different practice approaches. For example, exposure therapy may be used in psychology to overcome fear and meditation is used in spiritual practice to move beyond the limitations of the waking mind. On reading Welwood’s book, I am thinking that dreamwork may be a methodology which can be applied to both the integration of the self and the transcendence of self, even though these are two different areas for growth. Dreamwork can be used to deal with psychological issues as well as spiritual ones, making it a particularly potent practice. It’s not for nothing that Freud called dreams the Royal Road to the Unconscious. Dreams can also access different energies and levels of consciousness both within each of us and also in the wider energy matrix that interconnects us all. Dreamwork is well known for acquainting the dreamer with various hidden aspects of him or herself. Just the mere dreamwork practice of considering all things in the dream to be representative of one’s own various energies allows the dreamer to notice and acknowledge things and behaviors previously unaware to the dreamer. These newly discovered energies, once acknowledged, can be harnessed for a deeper understanding of life’s problems and offer more tools for living life. A dream may be given or requested which can provide guidance or a solution, or offer a far greater vision that allows one to rise above the limitations of a binding mindset or a complicated situation. The power of the dream provides new insights and even healing that change the game entirely. A combination of both insight and healing totally changes one’s understanding of the body, psyche and spirit. Also in dreamtime, one may encounter spiritual guides which lead a person on a journey of spiritual growth and deeper awareness. One may actually develop a “working relationship” with these guides that can later reoccur during meditation or dreamtime. The power of dreams is truly amazing but dreamwork is work requiring courage and consistency. It is a practice that if done faithfully and diligently can help one to both self-integrate and self-transcend. 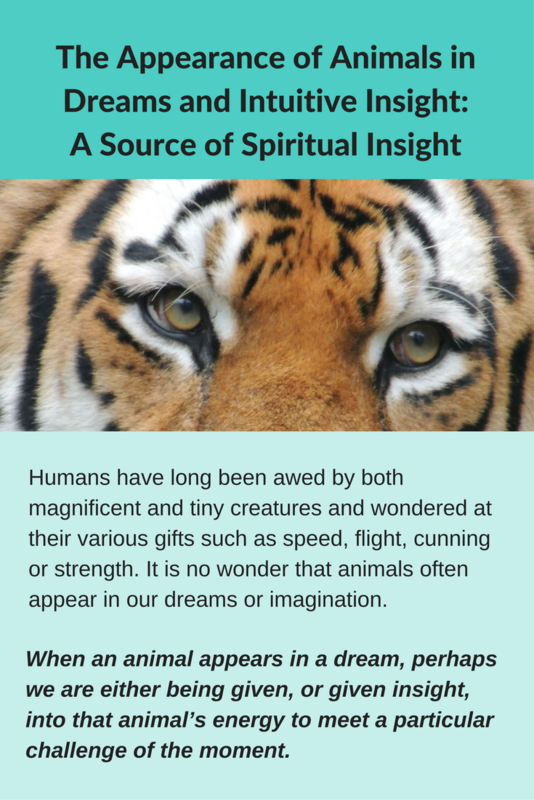 Dreams can indeed answer many kinds of questions, spiritually and psychologically, to grow more fully human. In a Spiritual Book Club I am facilitating, the members selected a very profound and experienced-based book by John Welwood called Toward a Psychology of Awakening. At the start, Welwood makes the point that his Christian upbringing (and it is my personal opinion, many of our Christian upbringings) did not provide experiential practice for realizing our true natures even though there was wonderful ritual and music. As a result, Welwood, like me and many in my generation, turned to Asian religions and other sources for insight. Even today, I personally believe this is the primary reason why serious seekers are not attracted to the mainline Christian religions: there is often too much emphasis on the organization, joining it, being a member, and contributing to it—when what people really want is an experience of the divine! In studying Buddhism at the graduate level, I was fortunate to have mentors who were well versed not only in meditation but also in working with dreams. For me, it was primarily through dreamwork that I first developed a spiritual methodology that gave me a deeply meaningful experiential access to the spiritual life and its healing. Later, through meditation, I experienced the power of intuition and other states of consciousness that inform one of the wide and awesome nature of our true being. With such experience, the scriptures, rituals and music had all the more meaning! I could personally relate to the stories of salvation and God’s presence in our lives. These no longer seemed like myths and fairy tales. Religion was no longer about following the rules or joining a group but about living a rich experience-based life with fellow seekers. I think that if Christianity is to thrive, it will have to incorporate experiential practices such as dreamwork and meditation into regular activities such as bible class and Sunday school.